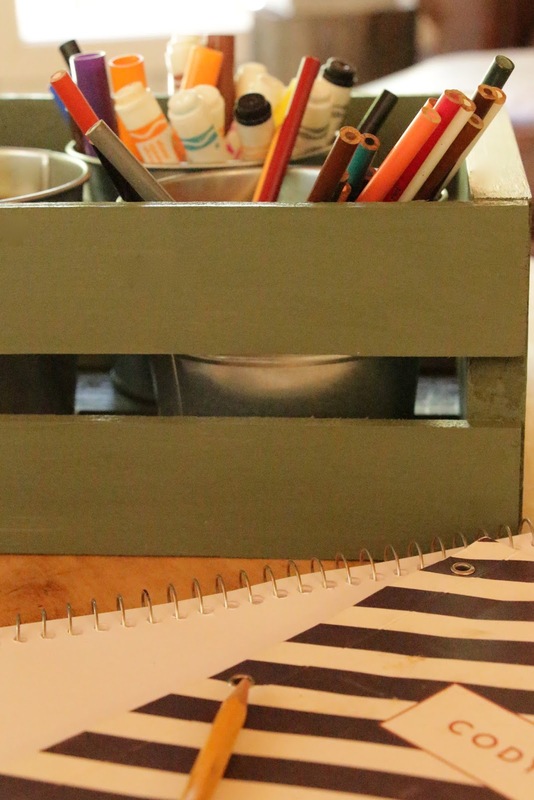 When I was contacted to come up with some creative ways to use large and small crates in a way that helps with back to school organization, I was all over it. By the way, if you click on that link you will see they are now selling deconstructed reclaimed and new pallet pieces! No more killing yourself trying to pry the pieces off! I knew right away what I wanted to do with the larger crates. The first thing I did was to stain them a rich ebony. 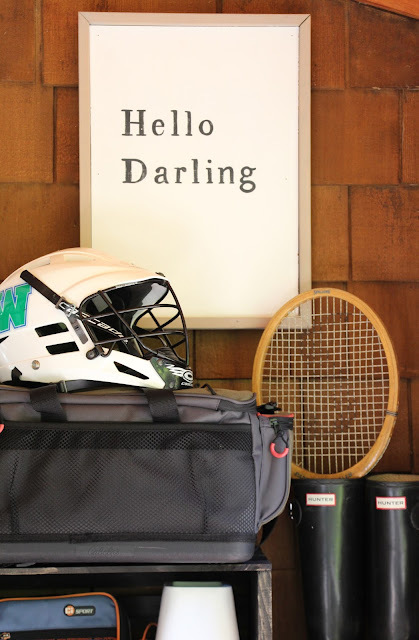 I don't know about you, but I always feel like there is such a small amount of time after school before it's dinner time and then the kids are heading off to sports practice's. Having everything in one place and organized is key. I also like that these are totally portable. I didn't attach them together, they are just stacked one on top of the other. I painted the smaller crates Rosemary by Sherwin williams and added some little buckets from Ikea in them. This makes a handy place for markers, pens, and pencils. How many times do your kids sit down to do homework only to spend too much time trying to find a sharp pencil? 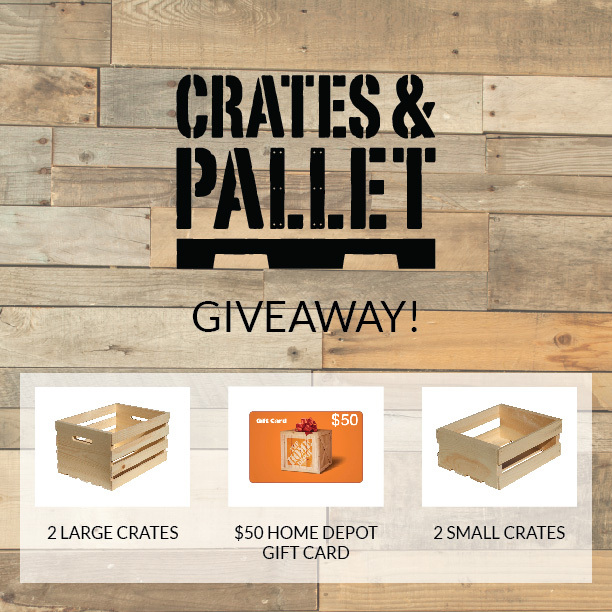 One of you will win 2 large crates, 2 small crates, and drumroll please…..
a $50.00 Home Depot gift card! Comment on this post telling me what you would do with your new crates. You do not need to have a blog to enter. Anonymous commenters count, just be sure to leave that email address so I can contact you if you win. I will pick a random winner on Friday July 17th and announce back here on my blog. I would use them at my daughters upcoming wedding. They will be perfect for the rustic theme. Love me some Home Depot! I would use them for storage in my guest room!! I love the sports equipment idea! What a handy way to keep everything. Would definitely be copying that one. I would make an art supply caddy with the small ones and use the larger ones for toy storage. My email is radurr(at)hotmail dot com. 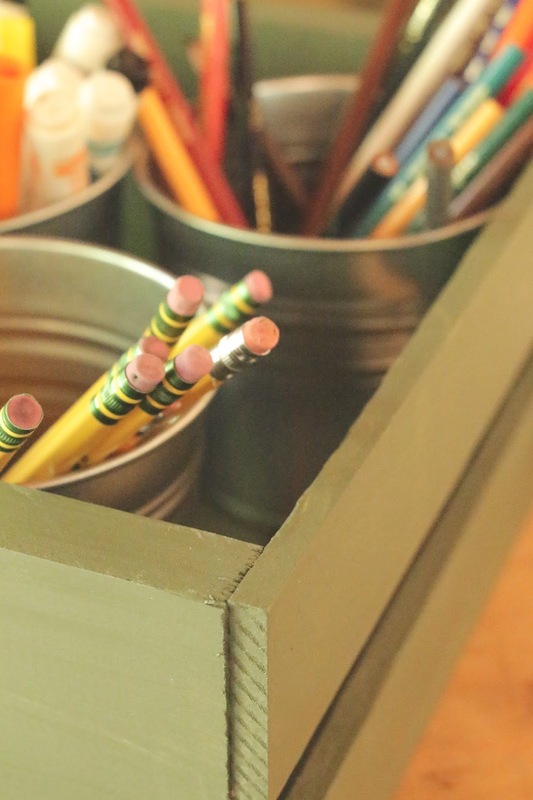 I would use them for organizing school supplies this fall, the larger ones would look fab in my entry way! 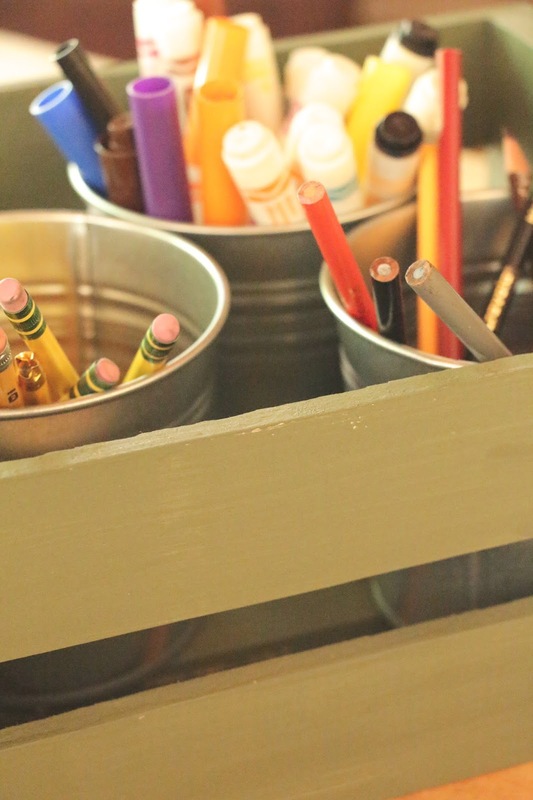 I would use them in my boys room to organize toys and like you to organize art supplies. Love Home Depot! Thanks! I would use them to organize my garage. These would be the perfect finishing touch to our new bathroom built ins! I would stack them on my porch for a few plants and a cute watering can. Love these. I would use them in my daughters playroom! Love them! What a great idea for a porch! I would do the same. I would make an art center for my son! They would be awesome for my vision! I would love to use these outside for entertaining to hold plates, utensils, and flowers! So cute! I need to organize a closet. I would hate to hide them but they would work perfectly. Thanks for the chance at this great giveaway. Have a great weekend. I would create an awesome looking area under my basement stairs-that nook NEEDS these crates! Thanks for the giveaway! If I won I would give it to my college student son who is an Architect major to use in his room that he is re designing. As an elementary music teacher, I could create a 🎶music corner🎶 with fun creative things to do for kids with extra good behavior! 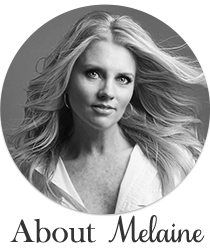 I enjoy following you on Instagram and love your blog! Thanks for doing this! With back to school right around the corner and my garage becoming a pile of shoes, flip flops, light weight jackets etc. I would love to use these crates to get organized for September where the kiddos can grab and go all the must haves to get out the door! Thanks!!!!! Would use them for son's closet to organize books, shoes, video games to make more organized. 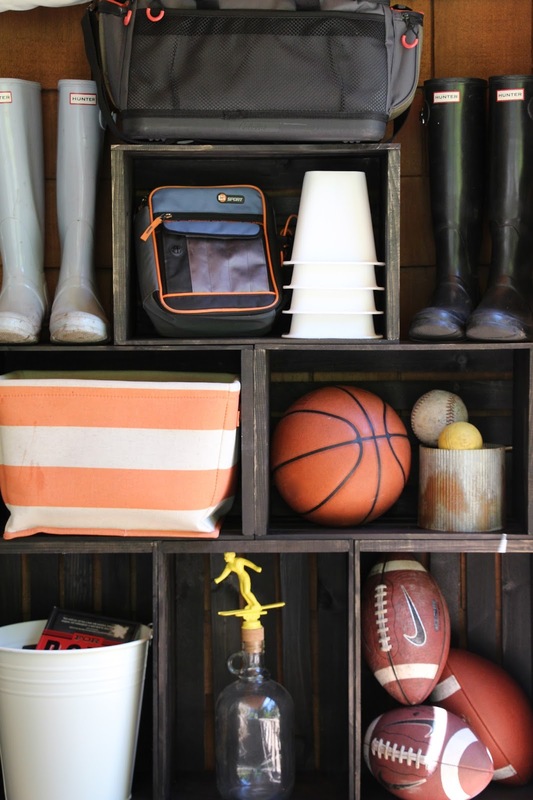 These crates can be very useful in any room. Thanks for giveaway!! I would use the crates for storage. And leave them out in the open they have such an appealing rustic look about them. I have an empty spot that needs "something" I think that the crates would look good there as a way to store my kids books. So cute! Forgot my email address! It is jendavehayden at gmail dot com and I would use the crates as a cute way to store my kids' books. Love this!! I would use the large crates for toy bins in my daughter's rooms, and the smaller for keeping fruit out on our island for snacks! Thank you for this giveaway! There are so many possibilities. I would love to put one in my kitchen for my recipe books. One in my son's room for his toys and books. I could also see putting one in my classroom behind my teacher desk as a special tote just for me! I am in the idea discovery phase for an above ground vegetable garden. 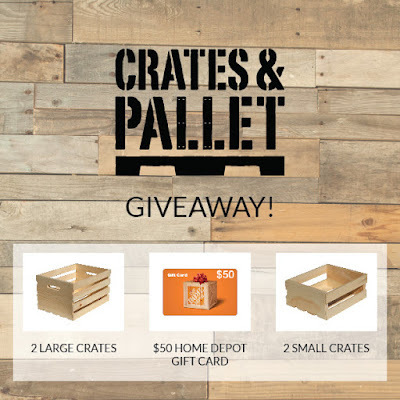 I bet these crates could be a starting point and the $50 gift card could not hurt!! I am redoing a desk for my daughter to do schoolwork at. I would love to incorporate these somehow. My name is Dustin McPhail (now) silly Google... I've tried to change it several times as Ford is my maiden name!!! I would love to use crates in my laundry room. Thank you for the give-a-way! Always so much inspiration on your blog. Thank you for that, as well. The perfect place is on my backyard deck to place assorted terra cotta pots full of of colorful flowers! 😜. I might even spray the pots light grey and stain the crates a darker shade. Thank you fingers crossed ! I would use them in our foster sons bedroom! They need shelves for their books and these would be fabulous! Thank you for a fun give away. I'm a recent empty nester.....love looking thru blogs for DIY projects! I'm turning my daughters room into my craft room/office. Would love to use these in the mix! These would be so cute to grow veggies in a small space. The boxes would provide the structure in which I could grow things vertically with easily removeable plant pots. I'm also thinking these could be so simple with white towels in the bath. Stain the crate and stencil a french word. And to be even more practical, stored by the door for the millions of flip flops that are currently taking over my first floor. Magazines.....my many magazines....would fit these boxes and could be lined up by my chair....yes....perfect!!!!!!! Thank you for this nice giveaway!! I would use one for my puppy to store her toys in and the rest in my boys rooms. Thanks! I would use one small one to organize dog toys and the other for cleaning supplies! The two large ones would house flowers by our front door! My husband was just asking if there was a nicer way to store all the random yard stuff on our deck. I think these crates would work! I was just think about some crates for my pantry so that is where I would use them. I would stain them and add some wheels. would love to use these to organize my craft room! or add some wheels for the garage?! These crates would be great on my back porch to organize all my garden stuff! I would use one for the dog's toy box. The other will used in my bathroom remodel. So many options! Love your idea for the crates! I would use them for storage in my craft room. I would have them painted and stacked as extra book shelves in the house. I would use them to hang on the wall and display some of my decorative plates on! I've been wanting to paint crates and add casters to store toys! Our boys are getting ready to bunk together with our 4th on the way in just a few weeks! They'd be perfect with the bunk beds my husband and I built! Thank you! I would stack them together...stained similar to yours...and make a book shelf. I'd use them to organize my garage. I would paint the white then hang the crates on my bathroom wall for extra towel storage. I would make them(stacked) so they looked similar to a built in shelf. I would use them around my house...one on the bathroom counter with towels and soaps, one near the door to catch shoes, hmmm...probably one in the guest bedroom and maybe one in the master bathroom. Too many ideas! The larger crate would be great for storing bottles of wine in! The smaller one, maybe for keeping herbs in their little starter pots? Lots of good uses for them. I love your ideas and would probably try to recreate them in my home. I would stain them and line them with landscape fabric..fill with soil and fill them with plants and flowers for my patio! We'd love to use them in our daughters' treehouse! 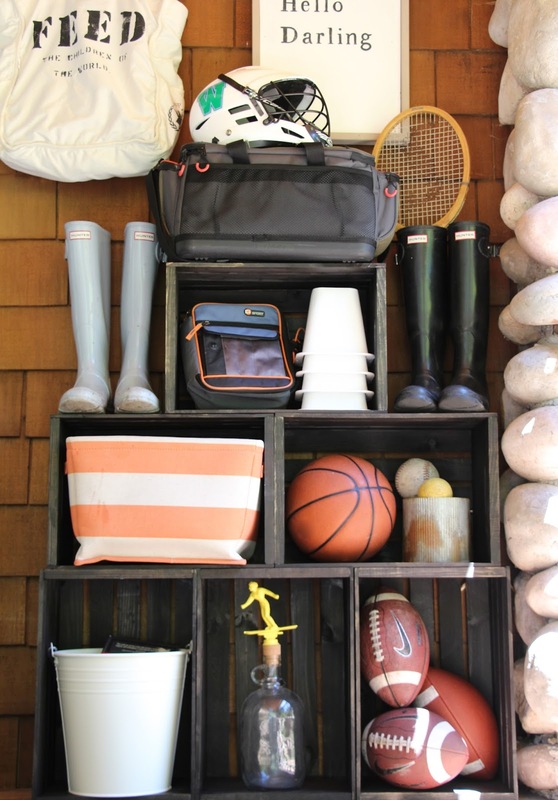 Would be great for stacking- storage for the necessities- game boards, books, flower vases, and picnic serving pieces! Thank you for the ideas! I would use the crates as decoration on the patio. I would stain them and put potted plants in them. I would use to corral and organize my laundry room! :) Thanks for a chance to win!! I would use the crates to organize my closet and garage! 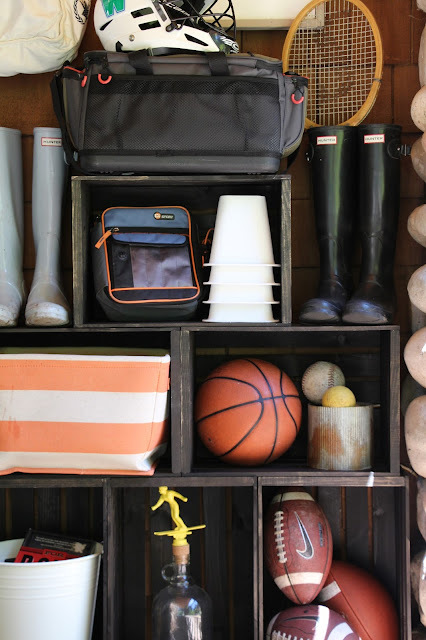 I would use the crates to organize my kid's outdoor toys in the garage. I would use them to store my son's toys! Perhaps a dog bed, padded of course. I also like the storage ideas. Leashes halter collars would have a home. Thank you. Definitely use in my office/creative area with some UK blue paint. Never too much storage in there. I would use the crates to help organize my back room . I have been wanting to try painting something but just havent gotten around to it. These would be fabulous in my art studio for holding my paints and fabrics. Thank you for the wonderful giveaway. i owuld use it in the girls room for craft and books! I would use them in my kitchen underneath a cute side table that's in there. Thanks for the chance to win! I would love to have these for my front porch paint them a pretty yellow and put my red geraniums inside. The pots they are in now are not so pretty! Ha! Ha! Thanks so much for the opportunity to win! Paint, maybe a bit of funky paper...upcylce...and use in my daughter's bedroom for "under the day bed storage". We live in an old old home (100 plus years)...her bedroom has no closet! Always looking for ways to create storage for her...especially for her shoes and those bulky winter sweaters! I would stain them and use them as shelves in our bathroom. Thank you so much for the giveaway! I would use them to display my book collection. We are about to have our back porch screened in. I could think of a bunch of ways to use a few crates. Maybe a couple of side tables or stacked with some potted flowers :) Thanks for the giveaway! I would put them on the porch and add flower pots in them and on them or put them in the mud room for bots and shoes. I would use the crates to organize toys. I need to organize several areas....books, art and sport supplies!! Pick me!! I am in the process of reorganizing the kids playroom. These would be fabulous!! I need organization for my kids bathroom. Two kids in middle school and one in elementary. Lots of hair and beauty products. Just redid the floors with barn wood tile and wainscoted wall. Now I need storage. crates would fit right in. My email is [email protected] Thank you for the chance to win this give-away. 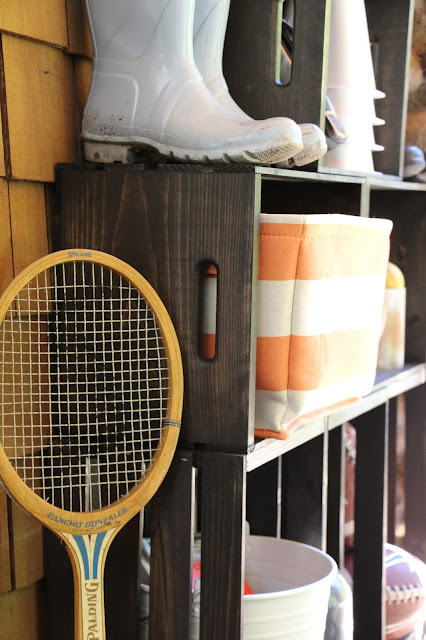 A place to store my kids outside toys is just what I need! We are building a pool cabana in our backyard and these are perfect for storing towels, sunscreen, bug spray, etc. Love them! I'd use the crates for storage in my pantry. I need to be more organized and these would really help. I would use them in our mud room as cute storage bins! I think they would look great on some ladder shelves with some greenery or some old books. I am just getting out of school and need to start decorating like an adult instead of a student! There are a few ideas I have for the crates. I would use them for shoes in the sunroom, fabric storage, or for craft books. I would use them with storage of my props for photography! I'd spray paint them a blue color and use them in my son's bedroom for his books and toys. I'd use one in our guest bathroom to hold magazines and the remainder I'd use to collect the toys around the house and to hold the many, many, many books I we own. I would use them in my closet for my clothing and sweaters. I would use them to organize all my craft supplies in my craft room closet. I would use it for organizing! I need to organize our playroom! We would likely paint them grey and use them for toys in our nursery. I would use them to organize toys! Thanks for the chance to win! such a lovely give away. i would use one for kindling on my porch come autumn and winter. Shallow ones might get used for art supplies. One might even get used as a planter. love how you used them on your porch. I would use this to organize our guest room closet. AKA my craft room, etsy store front and shipping depot. I could just see your face when they asked you to show some creative ways to use crates and pallets. Obat Wasir Ampuh Tanpa Operasi ? Segera Hubungi Kami Dan Pesan Obatnya Sekarang Juga di Fast Respond : 087705015423 PIN : 207C6F18. Obat Wasir Stadium 2 ? Segera Hubungi Kami Dan Pesan Obatnya Sekarang Juga di Fast Respond : 087705015423 PIN : 207C6F18.